This breed of dogs came into existence by the crossing of two breeds, The West Highland White Terrier and the Poodle. These types of dogs are generally called designer dogs, and are very popular among the pet lover due to their Hypoallergenic coats. This breed of dogs are highly energetic and brave, they are medium in size; they possess a nice and gentle expression. The Westiepoo is an intelligent and clever breed; they build strong relationships with their master and can become destructive if they are left alone. This breed of dogs does well with children and older people, they commonly do well with other small animals and pets. This breed of dog is also used as a guard and is very alert; they are destructive with strangers and have a tendency to bark if they see any danger. 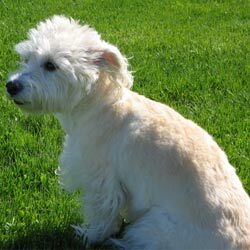 The Coat of the westiepoo dog breed is wavy, light in weight and soft they are average shedders. This breed of dogs requires early socialization and obedience training. Training should be given with fairness and patience, they will not respond to any hard and harsh methods of training. This energetic and athletic dog breed requires consistent exercise to remain fit. They are well suited for apartment living, if they are provided sufficient exercise, they love to go for a walk and enjoy family play sessions. The Westiepoo requires regular brushing to avoid dirt and dead hair, bathing should be done when needed with a mild shampoo. If you notice any signs or symptoms of disease or illness consult with a veterinary at the earliest.